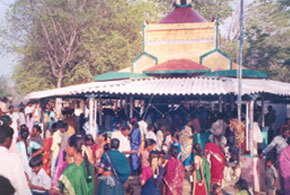 Viruduvilanginan was the good old sub-station of Athipakkam Parish, Pondicherry Archdiocese. Seven years back Rev.Fr. 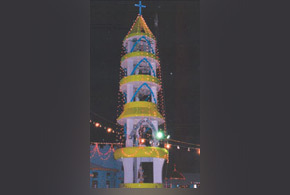 Anthony Thumma, the then Parish Priest of Athipakkam showed keen interest to make it a separate parish. Just at that time in November 1969 when the portions of North Arcot in Tiruvannamalai and Chengam Districts were detached from Pondicherry Archdiocese and attached to Vellore Diocese, Viruduvilenginan was one of those sub-stations with a good number of Catholic families, which the Diocese of Vellore was fortunate to get. Msgr. S. Lazar, S.D.B., the Vicar Capitular of the Diocese was only too happy to erect this village as a parish and appoint Rev.Fr. 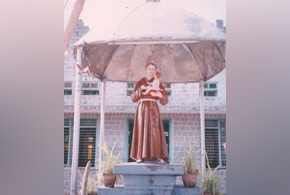 A. Nambikairaj as its first Parish Priest on 16th February 1970. There are 3 sub-stations, namely, Porrikal, Kadagaman and Valavetty. Fr. A. Nambikairaj started to put up a beautiful Shrine of St. Antony on 16th December, 1970, trusting in his powerful intercession. The beautiful and huge Shrine, built completely in granite stones in honour of this great saint surrounded by natural rivers, bushes and trees, was blessed on 13th June 1976, the feast of St. Antony. Within a year, people from all over, of all religions began to pay visit to this shrine and to pray to St. Antony honoured in a special manner at the entrance of the road leading to the Village from the Tiruvannamalai-Tirukoilur main road. In the early morning of every Tuesday, thousands of people flock at the Shrine to attend the Mass and offer their prayers to God through St. Antony. The previous night itself, people in hundreds gather to take part in the mass & in the prayers and to offer their offerings as gratitude for the graces received through St. Antony. Day by day, this Shrine invites more people from far and near. The feast of St. Antony is celebrated with great solemnity and all those who visit this Shrine of St. Antony, go back with peace of mind and enriched with grace.